Sandi and Jeffrey Lewis were fishing in their 14-foot boat near the Salt Run jetties July 21 when the unthinkable happened. Another motor fishing boat, around 40 feet long, barreled by at approximately 30 to 40 mph. “It was so instant, I looked back and my whole boat was full of water from the wake,” Jeffrey Lewis said. The anchor line was pulled by the wake, and Jeffrey wasn’t able to cut the line in time. “Within a matter of seconds, the boat totally flipped over,” Sandi Lewis said. The Lewis’ incident lasted hours before it was finished and it cost them peace and property. Officials said boating accidents such as theirs happen several times a year, and common boating problems in St. Johns County waters are carelessness and lack of experience among boaters. After the boat flipped, the Lewis’ climbed back on top of their boat’s hull. Belongings floated away in the water, including their fishing poles and her purse with wallet and bank cards, among other items. Some people picked up their property, but instead of returning it, drove their boats away. Others ignored them as they waved for help. Several boaters tried to help, including two young men, but were not able to tow the boat. Sandi Lewis went with one boat to safety, but her husband stayed on the boat and drifted out the inlet. Rescue crews helped him flip his boat over and officials from a tow company arrived and towed him back and pumped the water out of the boat. Lewis was able to recover his car keys, which were in the dry storage area. “It ended up being over two and a half hours that I was in the ocean,” Jeffrey Lewis said. He said his kidney was bruised after he fell while a group tried to tow his boat. Their boat was fine, but Sandi Lewis has decided not to go boating again after what happened. The Lewis’ said they are concerned what could have happened if a child had been on the boat. The Lewis’ are now selling the boat. “People don’t have respect for others any more,” she said. Officer Mike Pedonti said no one was able to get a name of the boat that swamped them. It has been described as a dark-hulled or white boat. He is planning to interview other witnesses before completing the report. Pedonti said boaters are required to maintain a certain distance only from military boats, but they are required to maintain a safe speed and be aware of docks in the area. FWC Lt. Steve Zukowsky said that by maritime law, wake from a vessel is an extension of the vessel and boaters should maintain a 360 degree lookout. Anchored boaters should also maintain a 360 degree lookout. U.S. Coast Guard Auxiliary Cmdr. David Patrick of local Flotilla 14-7 said everyone is responsible for their own wake on the waters, and often people don’t realize that when passing another boater. The auxiliary is the non-law enforcement arm of the U.S. Coast Guard. Officers patrol the area and make sure people are safely boating. They also perform free vessel checks and host boating safety courses. Patrick said the area near Salt Run and the jetties is not a good place to anchor down and fish because of all the traffic. People should also know that they cannot anchor within the channel. A couple of common problems that officers see on local waters are people dangling their feet over the bow of a boat, which is dangerous. Also, many people don’t wear life jackets. “Over 80 percent of the drownings that happen, happen because people are not wearing life jackets,” Patrick said. Patrick said there are life jackets available now that are not bulky and that inflate when they come in contact with the water. “It’s too late to put it on when the boat is swamped,” he said. Pedonti said common problems he sees are cases of boating under the influence, groundings, people operating boats carelessly and sometimes not obeying wake zones. People should be aware of what their wake can do. “People should always be courteous to other boaters,” he said. Glad they were alright. It could have been much, much worse. Scary thing those big fast dark-hulled boats. Seriously, I can see how something like that can happen if a vigilant lookout is not maintained. I came around a point one time throwing a big wake and all of a sudden, there's a fishing boat tucked into the reeds (we call them tules...pronounced 'toolies') along the shore. If I hadn't slowed right down, at the very least he would have gotten his feet wet. This could have happened at day break. Sounds to me like a sport fisher going to out didn't see a little boat???? I"ve done it, I bet the little boat didn't have lights on and was close to the edge of the jetti. Unless we get the whole story it's a non story. ps my lugger doesn't go 40knots but my fishing boat does. Good point, Swampu, but if he really didn't see him, I guess we won't get the rest of the story. I hope you're right about that though, cuz if he did see him, then there's another story. Oh yea, For the member that always bust my nuggets for laughing at people when their boats burn down or sink or other stuff. Again, everyone is responsible when you go on the water. You take care of your stuff and we will take of ours. heal, your right. That would be close to a manslaughter charge in my book. Don't have a lot of sympathy for fishermen in tiny boats fishing inside jetties. Kinda like skateboarding on a freeway off ramp. I would love to see a diagram of the whole situation before passing judgment...would also like to know a bit more about the inlet and prevalent conditions. The wake thing is out of control in both directions...thinking boats should never produce a wake around other vessels is a s silly as purposefully waking the crap out of someone. Stating over and over again that you are always responsible for your wake just tells me how little time a person has actually spent paying attention to what goes on out there. The concept that you are responsible for your own wake iis taught in boating safety classes, but I have researched it and have not been able to find a place in the US Code of Federal Regulations that indicates that. One could easily make an argument, that if the Smaller boat was not in a no wake zone, And was capsized by a wake, which is an expected thing, that it was not seaworthy for what they were using it for. You could also argue, that the captain of the smaller boat, was not keeping a Sharp lookout, and failed in his responsibilities to his passengers. I slow down from my 6.3-knot cruise speed when closely passing small open boats, which are usually anchored and fishing. ... It's typical for me to respond with a major turn to minimize the effects of large wakes of other boats. ... It's typical for me to respond with a major turn to minimize the effects of large wakes of other boats. Here a boat has made a sharp turn to port to counter the wake of a fast-moving boat behind FlyWright. I made a sharp turn to port to counter this fellow's wake. FlyWright, who was ahead of me and whose gentle wake is in the foreground, didn't have room/time to make a similar maneuver and had items thrown about as a result. With you on this, markpierce. 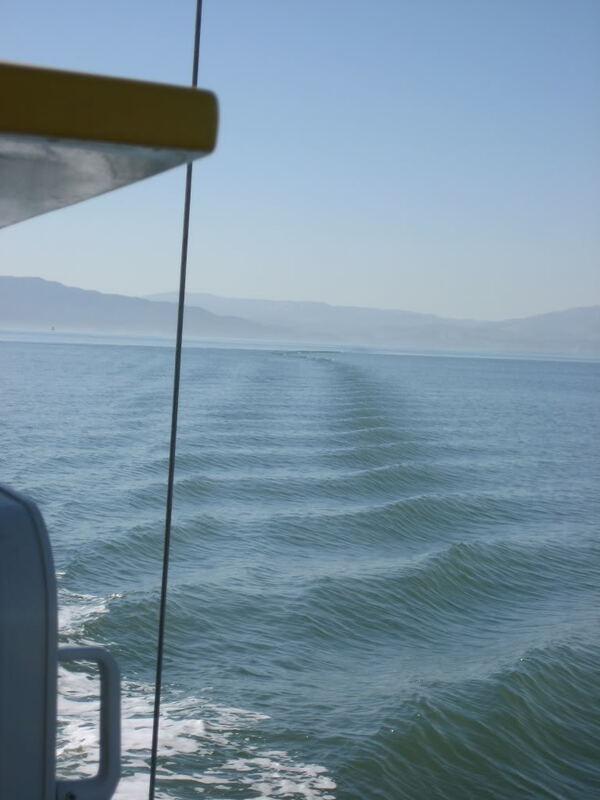 We all know the wake our boats put out at certain speeds, a prudent captain should operate with due regard to the safety of other vessels present. As we expect them to operate with us in mind, with care, courtesy, safety. Producing unrestricted wake in an area without wake restrictions, in the known presence of small craft vulnerable to that wake is like saying a pedestrian crossing the road outside a pedestrian crossing is fair game and can be run down with impunity. Each to his own. Do the wrong thing, injure or kill someone, risk being sued. Or not. Your call. "Do unto others..." works on the water, as well as elsewhere. This is mine at 6.5 knots. I think we won't hurt anyone. Unfortunately here in the states there can be so many boaters that have no clue about the "entire boating picture" that there is constant conflict in many areas. Small, tin boat boaters think just because their boats float with 3 inches of freeboard that THEY are safe in a busy inlet...well there may be more than one reason a boat must produce a bit of a wake and its IRRESPONSIBLE boating to be there in the first place..especially to fish there when there is a million square miles of fishable water all around..but they feel the need to fish the only stretch of water everyone else wants to use. Like the chuckleheads that fish just outside a long no wake zone then glare at you as you start to accelerate. Like there's no fish just a few feet farther into the no wake zone? Respect is a 2 way street. While I certainly agree and try my best to be polite and courteous on the water...it is often the "clueless" small vessel that is clogging the channels where only the larger and faster vessel can go. I consider them just as rure and discourteous as the larger vessel that makes a wake when it isn't really necessary. Highways in the USA also have MINIMUM SPEEDS posted to keep the "Sunday afternoon drivers" from slowing down others AND COMMERCE...they also have restrictions on pedestrians, horses, slow motorcycles, etc..etc..to keep the flow of traffic safe from "other travelers" that need to be elsewhere. But to keep up the mantra of "you are always responsible for your wake" shows that you must gloss over the most basic rules of seamanship in some cases and keep the myth going that endangers "less experienced and small boaters" who should be taught from the beginning to stay away from channels and high traffic areas. I taught the NJ Boating Safety class for 11 years and no where does it really describe "the big picture". It just talks of rules and regs to make it sound like you can cross an ocean safely in a dingy as long as you follow a couple rules and suggestions. If you spend just about every day on the water like I do...cruising, working and living aboard...I see just about every nice and bad thing about boating. It's just as much the guys who always complain or are endangered by wakes that are at fault as the wake producers. Just 2 days ago, Sunday, going out Ft. Pierce Inlet there was an open fishing boat with one guy in it anchored just outside the breakwater. He was definitely in the channel. Of course, (note to Flywright) I slowed to no wake speed. He was still there when I returned. What is it with these idiots. He probably deserved to be waked, but I just don't want to deal with the hassle. Here is a little different take. When cruising down the waterway sometimes a fishing boat will see us coming. They will take out before we get there running down the waterway. Of course they are faster than a cruiser.they think. I will come up behind calling on the radio with no answer, blowing the air horns with no results, then ease up until the bow is nearly along side. When they finally see it their eyes get quite large. I will motion for them to slow and start slowing myself. Some slow some don't. The smart ones will slow or at least cut away. If not I will be looking for enough water to swing out an pass. Here's what we have in Resurection Bay, Alaska. This is a major tourist destination. There are tour boats that depart all the time. There are charter boats that depart for full and 1/2 day charters all the time. The entire communities economy is based on these boats, and the tourist dollars they bring. The area is also popular with local fishermen. The bay hosts one of the largest returns of Silver Salmon in the world. The bay is approx 20 miles X 5 miles, and is dotted with islands, narrows, etc... The mornings are generally flat calm, and the afternoons are typically choppy from sea breeze produced waves. I have seen, and I hear every single day fishermen calling the USCG asking them to cite a boat for "waking" them. The problem is this is uncontrolled ocean. The no wake zone ends at the harbor entrance. The charter and tour boats throw a heck of a wake. Many of the charters are approx 50' and are runing full speed towards or returning from the halibut fishing grounds some 50-60 miles away. They cannot slow down for every boat, so they slow for none of the boats. They are as courteous, and give as wide a berth as possible, but traffic is so heavy that theres no way for them to slow to displacement speed. The problem as I observe it is with the 16-24' boater that is new to the sport. He goes down to the local boat store, and buys his fast alumanium boat with a big outboard that has the word "ocean" or "sea" stenciled on the side, sold by a clueless salesman who promises that his boat is safe for him, his family, and all of their friends in the open ocean. Put a VHF on it, and a Garmin GPS and you've got a guy that thinks he can go anywhere. The concept that you are responsible for your own wake is taught in boating safety classes, but I have researched it and have not been able to find a place in the US Code of Federal Regulations that indicates that. I teach those classes. I've looked too. It's not there. The issue is liability for ANY negligent action by your boat. Not just wakes. It would be up to the judge to decide whether the wake in question was the result of negligence. I agree that the waked vessel is sometimes more to blame than the one making the wake. If you're in a large commercial shipping channel, or even in a marina at the edge of it, you have an obligation to prepare your vessel, crew and passengers for wakes. To my way of thinking, failing to do so is negligent. The way this article is written, my thought is that the fishing vessel might have been anchored from the stern. Fine on a calm day in protected water " maybe ". But not such a good thing any where there could be any kind of current or wave / wake action. Just a thought and something I think is worth a mention. I am on the Fraser almost daily. Some of the stuff is just not believable unless you actually see it. Like the two guys in a canoe sitting on lawn chairs working there way down river. Tug running up river sees em but not in time. Two guys get wet loose the lawn chairs almost there life and get rescued by some good sam. The Fraser River is a working river , meaning commercial operators equipment etc etc. Yet some folk really believe with zero understanding of the marine environment that they have a rite to use of this "play ground" and that all should be "made safe" for that use. I do not see how that is possible to do. But then I do not use lawn chairs for "working" a canoe. 10. What are the regulations concerning wake effects, wake damage, and responsibility? Regarding one's wake, vessels over 0 Gross Tons are specifically required by Title 33 CFR 164.11 to set the vessel's speed with consideration for...the damage that might be caused by the vessel's wake. Further, there may be State or local laws which specifically address "wake" for the waters in question. While vessels under 0 GT are not specifically required to manage their speed in regards to wake, they are still required to operate in a prudent matter which does not endanger life, limb, or property (46 USC 2302). Nor do the Navigation Rules exonerate any vessel from the consequences of neglect (Rule 2), which, among other things, could be unsafe speeds (Rule 6), improper lookout (Rule 5), or completely ignoring your responsibilities as prescribed by the Navigation Rules. As to whether or not a particular vessel is responsible for the damage it creates is a question of law and fact that is best left to the Courts. For more information, contact your local Marine Patrol or State Boating Law Administrator. That's why you don't call the USCG in most places as they really don't enforce "wake" stuff...unless there is damage and a negligent boating issue can be made.